Where LeBron James will play next season and beyond remains a hot topic of debate. 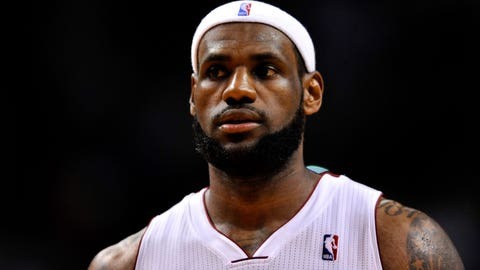 LeBron James began to distance himself from Miami Heat management during the season and has yet to reach a firm decision on where he’ll sign next, a source familiar with James’ thinking told FOX Sports Ohio on Sunday. James opted out of his contract last week to become an unrestricted free agent. All-Star teammates Dwyane Wade and Chris Bosh also opted out of their deals over the weekend, leading to strong speculation all three are planning to re-sign with the Heat at more manageable rates. However, the source insisted Sunday that James’ next destination is "truly up in the air." James met with Bosh and Wade to discuss their future together last week, according to multiple reports. James informed the Heat on Tuesday he would opt out, with Wade and veteran forward Udonis Haslem doing the same Saturday. Bosh informed the Heat on Sunday. Check out the hottest NBA dancers. Which ones are your favorites? "It may have been planned, but it sure doesn’t seem like it," one opposing team executive told FOX Sports Ohio of the staggered Heat opt-outs. "It feels clunky, strange." Another executive went as far as to say the Heat would be better off not re-signing "the fading Wade" at all, and instead spending that money elsewhere. NBA teams can begin negotiating with free agents July 1 and signing them July 10. James has been linked to several suitors — including the Cleveland Cavaliers, the organization he left in free agency in 2010. The Houston Rockets, Phoenix Suns and Los Angeles Clippers are also supposedly hoping to speak to James or his Cleveland-based agent, Rich Paul. James is well aware of the Cavs’ interest, the source said. Several other sources suspect James, Wade and Bosh all will re-sign with the Heat, and negotiate more opt-out clauses into their contracts. The first source believes if James returns to Miami, he would like the ability to opt out again at the end of the 2014-15 season. Earlier this month, the source indicated James felt no strong attachment to Miami or the organization, and that the decisions of Bosh and Wade would not impact what James’ does next. After the Heat suffered a convincing 4-1 series defeat to the San Antonio Spurs in the Finals, James said he would spend time away with wife Savannah and family to help determine his next move. Sources have told FOX Sports Ohio that Miami is not at the top of Savannah’s wish list of places to live. San Diego and her hometown of Akron, Ohio, are higher on the list, sources said. The Heat have advanced to the Finals every year since James arrived, winning championships in 2012 and 2013.